A legacy of client care, innovation and well-engineered designs. When electrical engineer Mel Cammisa started his own business in 1958, he laid the groundwork for what would become one of the best-known and most enduring consulting engineering firms in San Francisco. Two years after the firm’s inception, he found a partner in electrical genius Darrell Wipf, and Cammisa + Wipf Consulting Engineers was born. Since then, the company has applied its design and engineering expertise to a multitude of projects in northern California impacting just about everyone who lives, works or studies here. Highly respected in the industry, Mel and Darrell built strong relationships with their clients and with other firms throughout the San Francisco Bay Area. They established the structure of principal involvement on every project, which is a model we continue today. Not only does this ensure that clients benefit from the value of years of industry experience, it also contributes to our practice of mentoring and promoting from within. Eighty-five percent of our principals and managers have been promoted from within. 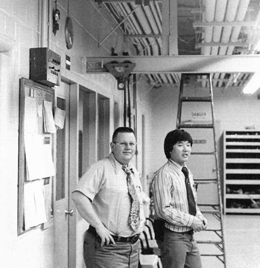 The reputation that Mel Cammisa and Darrell Wipf built through their commitment to excellence, attention to detail and innovative ideas is one of the many reasons the company has been so successful.